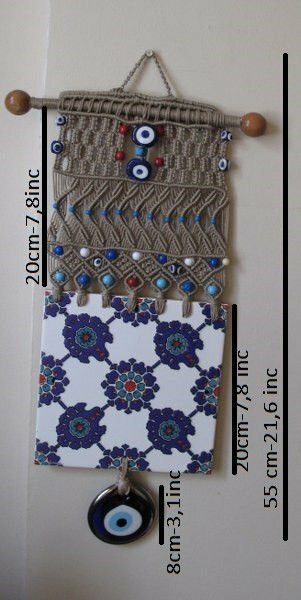 Turkish ceramic door -wall hangings with macrame technique.Use evil eye,everything is ok.This hanging could help you to keepevil spirits out ofyour home and keep you safe. Wherever you go in Turkiye you'll see evil eye beads.They hangover doorways car ,mirror inside of the car etc..Those evil eye beads are handmade and they protect you from evil eyes and also protect you looking at you in envy .Square Ceramic sizes is 20*20cm(7.8 inc) and glass evil eye 8 cm (3.1 inc) in diameter.Handmade by me. *********************************Handmade with great care, in a smoke-free, pet-free home. Never been use. ***********************************Please Contact with me for delivery time.I send all orders by local Postal Service,For faster shipping, please send me message.,,***********************************All custom orders ......EVERYTIME YOU HAVE A SPECIAL PLACE IN MY SHOP. ************************************Thanks for visiting my shop. I'm always looking for new combinations.Please come back again to my shop and discover new amazing creations. Please don't wait purchasing until last minute.